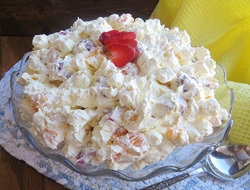 This sweet and fluffy salad is full of all your favorite fruits. Everyone will love this salad so don't be surprised if there isn't any leftover. Mix pudding and buttermilk; fold in cool whip. 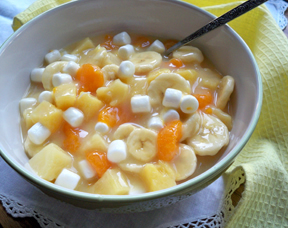 Add the bananas, pineapple, mandarin oranges, strawberries, and marshmallows. Note: You can add any fruit of your choice. 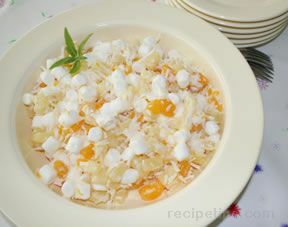 "This fruit salad was so delicious and so easy to make. I made it for a birthday party we went to and all the young boys went back for seconds. There wasn't anything left to bring home. This will be a new favorite at our house!" "I make this salad several times every summer. I have had my own made-up recipe in my head that I usually go with. But I saw this one and decided to try it as it is somewhat different from mine. 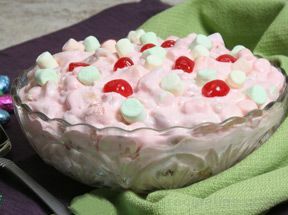 My family found it quite good and I was asked for the recipe several times. It involves a little more work than I usually put into this kind of salad but it was well worth it."